All of the certification programs at the Dr. Ida Rolf Institute® focus on five areas of knowledge and skills, or school wide learning outcomes including the following: Seeing, Touch, Embodiment, Therapeutic Relationship, and Didactic. Students must demonstrate that they understand the concepts and are able to do the skills tied to these outcomes in order to complete their program. The Rolf Institute Assessment Rubrics for each certification program outline the specific knowledge and skills for each of the five school wide learning outcomes. These rubrics are the basis for assessing student success in their program. Whether you are just beginning your career or are already a trained professional, The Dr. Ida Rolf Institute™ has a program that will provide you with the skills, expertise and reputation to succeed in your career. In order to receive final certification, all students must successfully complete the Basic SI Certification Assessment for Graduation. is eligible for Federal Student Aid. is NOT ELIGIBLE for Federal Student Aid. The Advanced Rolfing® Certification Program is a 168 hour course designed to deepen the practitioner's knowledge and skills of structural integration. Student graduates who meet the requirements for basic structural integration certification from either the Dr. Ida Rolf Institute™ or from an approved IASI school AND who have met all required and approved intermediate continuing education pre-requisites, may take the Advanced Rolfing® Certification Program. For graduates of the Dr. Ida Rolf Institute™, students must complete the required Rolf Institute intermediate continuing education pre-requisites, in addition to meeting a required number of years as a Rolfing SI practitioner. In order to maintain membership affiliation with the Dr. Ida Rolf Institute™, the Advanced Rolfing® Training must be completed within seven years of the initial Rolfing® certification, or within nine years if one first completes the Rolf Movement® Integration training. 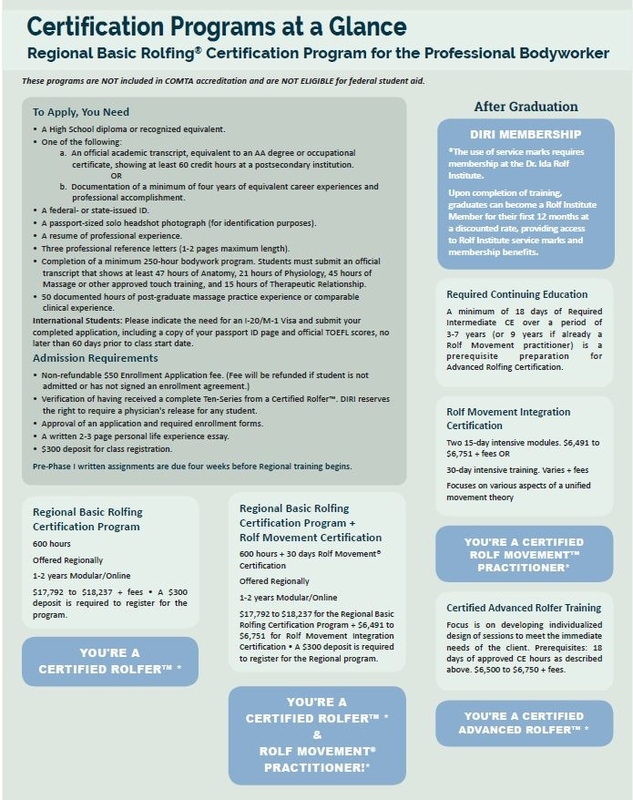 For graduates of approved IASI schools, students must complete the required intermediate continuing education courses, as well as the Rolf Movement® Integration Certification program. For a full list of IASI approved schools, click HERE. In order to receive final certification, all students must successfully complete the Advanced Rolfing Training Assessment. Framed in the principles of Rolfing Structural Integration, the Rolf Movement® Integration training program teaches practitioners to utilize a combination of touch and verbal instruction to guide the client's body towards greater ease and freedom. In the Rolf Movement® Certification Program, Rolfers deepen their holistic understanding of the body's function in gravity and learn to honor the client's ability to integrate with and adapt to his/her environment. Rolf Movement® Integration Certification is a fundamental, valuable complement to the basic Rolfing Certification. The program emphasizes the significance of supporting the client's full participation in and awareness of his/her own Rolfing process, the ultimate goal of which is the grace and power that emerges when a person becomes present with their own body and environment. 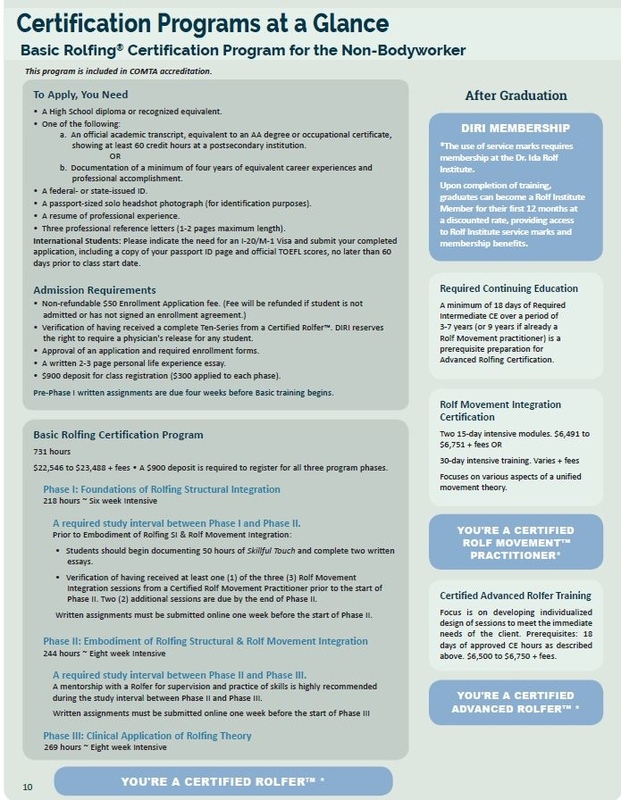 In order to receive final certification, all students must successfully complete the Rolf Movement® Integration Training Assessment.